Trillium enhanced public awareness of a counseling hotline and text service for Americans experiencing emotional distress due to hurricanes, wildfires, mass shootings, and other disasters. We conducted formative focus groups with people emotionally affected by disasters, developed messaging, and drafted the Helpline’s strategic marketing and communication plan for becoming the go-to national resource for disaster-related emotional distress. Trillium also developed Helpline materials, including a stakeholder recruitment booklet and a press kit for use by the national Helpline staff and the four local crisis centers that make up its network. 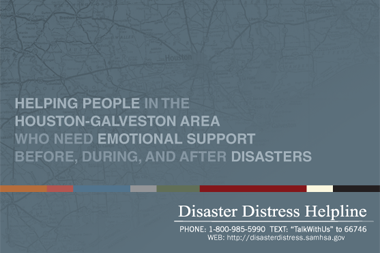 In addition, we conducted a pilot test of the Helpline promotion initiative in the form of a targeted marketing and earned media outreach effort designed to stimulate call volume in the Houston and Galveston, TX, areas where recent hurricanes had left many emotional scars.